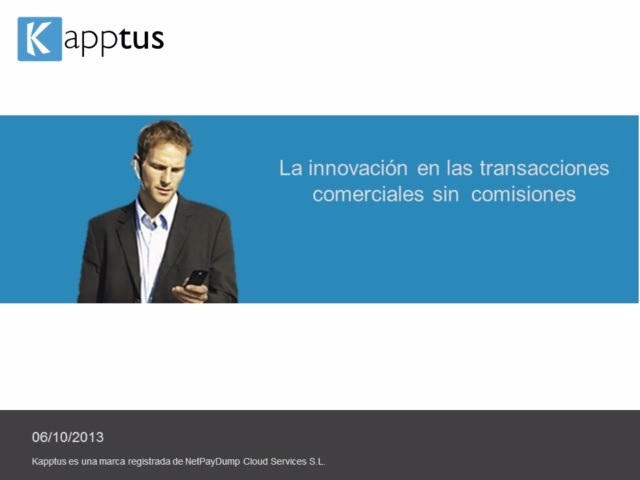 Kapptus is a registered trademark of CSA NetPayDump SL, 100% Spanish company with headquarters in Paseo de la Castellana 93, Madrid. Kapptus is a Services platform that has his own purchase/sale mechanism in order to use with micro payment using an electronic wallet independently of any financial institution. Kapptus don´t have fees for this service either for the buyer or seller. The services offered by Kapptus allow better communication between buyer and seller, inside and outside the Internet, due to more efficient management of supply and demand. In Kapptus have removed intermediaries that do not add value and raises prices. Kapptus presents an innovative way to understand the concept of "social shopping" providing users with a unified experience in commercial transactions creating a bridge between e-commerce, trade between individuals and the traditional trade through a Universal Point of Sale and Purchase in the Smartphone. Do you think you can be Kapptus user? If you buy or sell something but you do not like plastic money because represents the insecurity and you like to pay cash but without afraid to theft or loss. If you're an individual user, would you like to have the purchasing power of large business groups? If you're an enterprise, would you like to offer your products and services in a direct way to your customers without intermediaries that raise the product and do not add value? If you feel identified with any subject of the above, Kapptus is your App. Is Kapptus a secure platform for my business transactions? Kapptus has the highest levels of security by encrypting all communications, NO stored financial or personal data on your Smartphone, NO send financial or personal data via the Internet. In case of loss and / or theft of your Smartphone, your wallets will be perfectly protected by a PIN that only you know and that is not stored in the terminal. You can find other interesting information about security following this link www.kapptus.com/seguridad.html. Si has llegado hasta aquí, tal vez te interese saber cómo funciona Kapptus viendo este video.